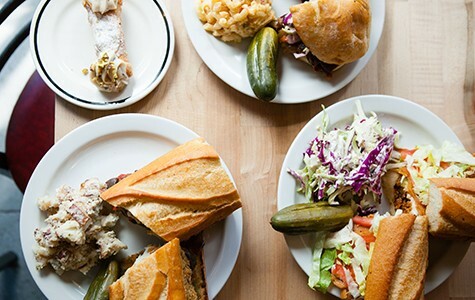 Berkeley's new vegan deli offers delicious, hearty sandwiches and Italian-American specialties typically reserved for omnivores. The Butcher's Son specializes in vegan "meats" and "cheeses." Having been vegan for nearly five years, I've come to learn that certain places are simply off-limits to someone with dietary proclivities such as my own. Italian restaurants, for instance, are usually a no go unless I want to eat skimpy noodles while everyone else dines on meat and seafood dripping with melted cheese and butter. Same with Korean barbecue and Brazilian steakhouses — neither of which typically have much to offer for herbivores. 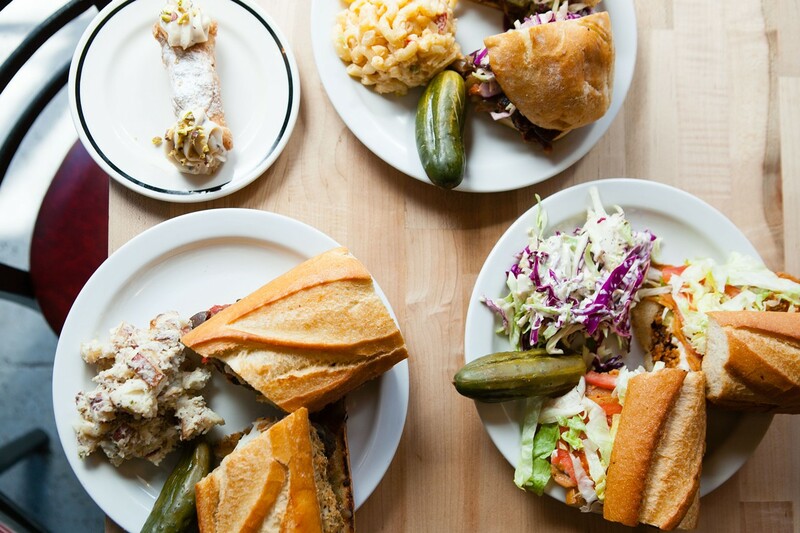 But rather than staying away from supposedly prohibited cuisines, the team behind Berkeley's brand new vegan deli, The Butcher's Son (1941 University Ave.), sees them as a challenge to innovate. The freshly minted establishment is the brainchild of chef Peter Fikaris, who honed his skills with faux meats at The Source in San Francisco, and his sister and business partner, Christina Stobing. Fikaris, who is vegan, came up with the concept for The Butcher's Son after a trip to New York, where traditional Italian-American delis abound. The lack of vegan options he encountered inspired him to create a deli catered to those with plant-based diets. Stobing and Fikaris' father was the owner of Michael's American Vegetarian Diner, which was in business on Telegraph Avenue in the 1990s, and Italian cooking was one of his specialties. While the siblings were raised vegetarian, they wanted to create vegan versions of their favorite Italian-American foods that don't cut out any of the richness. "You can get vegan food in different cuisines, but Italian is hard," she said. "It's more of a challenge to make these delicious, vegan Italian foods filled with ricotta and other delicious cheeses." Furthermore, one of the hardest things about going vegan isn't necessarily forgoing certain foods: It's missing out on social rituals that are based around particular meals. And one such experience most vegans must bid farewell is visiting an old-school, Italian-American deli and choosing items to take home by the pound — something The Butcher's Son seeks to remedy. Because the deli officially opened in late February, its menu is still limited, but features a rotating selection of decadent sandwiches in addition to bulk items behind the counter. According to Stobing, its offerings will expand soon. When I came in last week, I saw pulled "pork" and a teriyaki pineapple roast available in bulk in the display case, as well as a selection of plump, vegan croissants — plain and chocolate — and egg- and dairy-free cannolis miraculously oozing with rich cream. While the deli counter was surprisingly somewhat bare (I was looking forward to bulk vegan cheeses, which are coming soon), the sandwiches were the main attraction, and customers lined up eagerly during the entirety of my midday visit. The lunch menu was informally tacked onto the glass display case with a piece of tape and featured vegan takes on such classics as a fried mozzarella meatball sandwich, a Philly cheesesteak, and a pulled-pork sandwich. Almost all of the fake meats at The Butcher's Son are made in-house using a blend of seitan (a wheat gluten-based protein), mushrooms, and textured vegetable protein. I sampled the "meatball" sandwich with "mozzarella" sticks — which was exquisitely rich, with mushrooms, marinara sauce, and grilled bell peppers adding a complexity of textures and flavors to its salty and fatty main components. On the other hand, the "pulled pork," which was made out of yuba (a tofu skin culled from the congealed layer that forms atop boiled soy milk), was somewhat chewy, especially when served on a tough ciabatta roll — though coleslaw lent the sandwich a refreshing coolness. The Grinder, which may soon become a menu staple according to Stobing, was the best sandwich I tried, with spicy jalapeños and crunchy lettuce accenting the tender "beef" and "chicken" seitan on a flaky baguette. While people become vegan for a variety of reasons — eating better, decreasing their carbon footprint, concern for animal welfare — The Butcher's Son isn't for the health-nut crowd. This a place where vegans can enjoy the delicious experience of falling into a carb-induced food coma. And while the fake meats are genuinely tasty, the amount of glutinous ingredients renders the majority of the menu a bit heavy and bready. Still, The Butcher's Son is in its soft opening phase, and Stobing said that, soon, its menu will include salads, lasagnas, and ravioli, as well as more types of sandwiches and bulk faux meats and cheeses. It's off to a strong start so far and, with the recent closure of long-running vegan restaurant Café Gratitude, is a welcome addition to the East Bay's plant-based food scene.